Thirteen is the first of Steve Cavanagh’s novels that have crossed my path. Having picked it up, however, there’s been a theory formed that the cover has been dipped in glue. Yes, it really is that hard to put down. They were Hollywood’s hottest power couple. They had the world at their feet. Now one of them is dead and Hollywood star Robert Solomon is charged with the brutal murder of his beautiful wife. This is the celebrity murder trial of the century and the defence want one man on their team: con artist turned lawyer Eddie Flynn. All the evidence points to Robert’s guilt, but as the trial begins a series of sinister incidents in the court room start to raise doubts in Eddie’s mind. What if there’s more than one actor in the courtroom? I have to admit that when I read the tag line, the initial reaction was “really?” Having heard a great deal about the author however, giving it a whirl seemed like a good idea. Boy, was ever there a time when reading the tagline was a bad idea!! Packed to the gunnels with action, Thirteen is a thriller that enthrals from first page to last thanks to Cavanagh’s adroit, filmic prose and wickedly dark humour. On top of this, Eddie Flynn – the deliciously crafted protagonist – and the whole cohort of characters are so well defined, rounded and, well, “real”, the reader cannot help but be drawn into their individual worlds so deeply, we can reach out and touch them. Added to this is the cleverness of the deftly structured plot, the relentlessness of the pace and the overall almightyness of the story telling. Barely a word is wasted, which therein has the narrative twisting and turning inside out with every page until the denouement is reached. 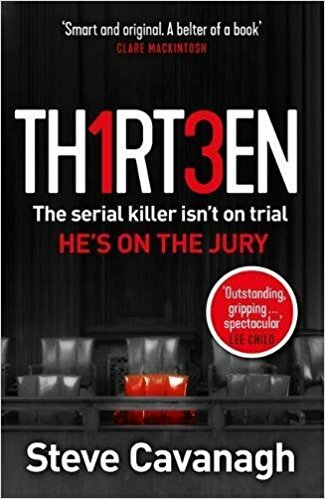 In short, everything you’ve read, heard or seen about Steve Cavanagh’s ability to captivate is true and although Thirteen may be the first of his to be reviewed here, hopefully it won’t be the last.